I have yet to read as many Edith Wharton novels as I would like to – although I do have about five TBR. This one immediately appealed to me – and yet I have been left rather disappointed in it. Edith Wharton is famous for having written novels that lift the lid on the society in which she lived. 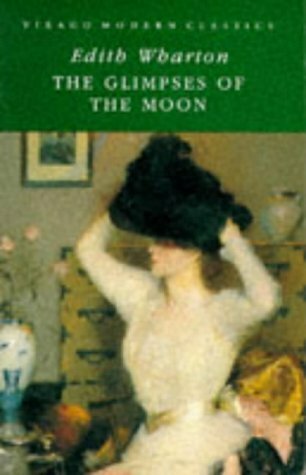 In The Glimpses of the Moon, she satirises those bright young things with more money than sense, who divorce their spouses at a drop of a hat, and the poorer hangers on who live off them. Susy Branch and Nick Lansing live in a society driven by wealth, a world where the idle rich flit between the playgrounds of the wealthy, Paris, Italy, English stately homes. Susy and Nick are part of this set but rely on the generosity of their friends to live. These friends marry to suit their advantage – leaving romance out of the question, then they skulk around having affairs – and if divorce is required quietly get on with it as if it is of no consequence. Susy and Nick have fallen in love, they are fully aware that they each need to be on the lookout for wealthy partners – but instead they come up with their own experiment. Their bargain is to marry – and then to live as long as possible on the hospitality of their friends – moving from place to place. They think they can keep going for a year – but part of the bargain is that should the chance of a better marriage come along for either of them the other will move aside. However this bargain doesn’t take into consideration their feelings and Nick has long had enough of this kind of life. Susy is slower to realise this parasitic lifestyle has consequences, that in return for weeks spent blissfully in a Venetian villa they are expected to play a part in a rather unpleasant deceit. When Nick realises that an expensive pearl pin he has been presented with is in payment for aiding this deceit, and that Susy has been fully aware of far more than he has, he is furious and leaves Susy in disgust. Nick behaves with a certain amount of stubborn arrogance, storming off, hooking up with a yacht full of nouveau riche, the Hicks, and not writing to Susy. Nick’s name is soon linked with that of the daughter, Coral, who although not beautiful, has many similar interests as Nick, with whom she gets on well. Meanwhile Susy paints on a smile, pretends to be unconcerned and carries on with her friends as usual – for a while. Her name is soon linked with that of her great friend English aristocrat Streff – who has suddenly come into a huge fortune, a title and an estate upon the sudden death of his cousin. With neither of the young Lansings writing to the other, they can only keep track of each other via the gossip columns and society pages of the press – leading to the obvious misunderstandings so beloved of romance writers. It is fairly obvious from the start of this novel – that there will be a happy ending – this is undoubtedly a morality tale, although the reader can’t help but feel that Wharton liked her two central characters too much to separate them completely. Susy too, soon sickens of the life style she is leading, and realises that she still loves her young husband. She may like the idea of being rich, to be able to buy fabulous jewels and furs herself rather than have lovely things merely gifted to her by her patronising badly behaving friends, but she isn’t so happy with what she will have to do to attain such wealth. I’m still not entirely sure why this novel was only a three star read for me. There is a light, frivolous tone to the novel – despite Wharton’s excellent writing, this is may be a tone I don’t especially like, especially when I was expecting something deeper as I was reading Edith Wharton. I also didn’t like many of the characters – I generally don’t need to like characters I am reading about – but in this case their behaviour just infuriated me. I also loathed the lifestyle that Wharton highlights in this novel – I am sure she meant it to come across as loathsome, but it just served to disengage me. I am sure I will be reading more Edith Wharton soon; I just need to remember that not every novel can be The House of Mirth. Excellent review Ali – it’s always a shame when we don’t get what we expect from a book. And I suppose authors are only human so not all their works will come up to scratch! I have not read enough Wharton, despite having several volumes on Mount TBR. Generally from the few of hers I have read I really like her, plus she interests me as a person. Enjoyed your review; I recently read The Glimpses of the Moon and felt much the same; I’d expected something a little more from the author; this one was just *too* contrived. One of my biggest stumbling blocks was Susy’s complete change of character at the end. Her happy embrace of an impoverished lifestyle and (temporary) surrogate motherhood (as it were) felt unnatural from what we’d already been shown of her character. I just checked my own review, and I see that I gave this novel a 6/10, so we’re in total accord. 😉 But I’m glad I read it; it also made me curious about some of Edith Wharton’s other secondary novels. Yes I think this was definitely a secondary novel. I was going to point you to The House of Mirth, but I see from your last sentence that you already have! I really loved The Age of Innocence, as well. My next Wharton will be The Custom of the Country. Have you read that one? I have read The Age of Innocence, Ethan Frome, The House of Mirth and The Children. I have The Custom of the Country on my kindle – but I want to read it in a physical book really so I keep putting it off, also people keep saying it is one of the best so I want it to look forward to. Two things: Dear Governess is a collection of letters between Edith and her German governess, a relationship/friendship that lasted until death. A fascinating read and glimpse into their private lives. Also if Valley of Decision is on your list of Wharton novels to read, good luck. I was lost from the beginning, and ended up skimming over long passages just to get to the end. I never did understand what the point of the novel was. Also, who names a hero ‘Odo’ and expects the book to be taken seriously? I think it was her first novel, and it reads like a first novel. It is interesting just for knowing it was her first attempt, but other than that, a very dull read. oh, one to avoid then, I’ve not even heard of that one. This is one of the few Whartons I haven’t read, and it does sound disappointing. I don’t see her style working with the contrivance or in that particular milieu. The contrivance was annoying, although she was clearly trying to say something about the people who lived in a such a way – but it didn’t quite work. I wonder if the happy ending was the problem. I have just finished listening to the novel as an audio book. The narrator was excellent and her characterisations were perfect. Despite the fact that the story is set in a past social milieu which may appear dated now, the narrative I believe has universal relevance. How often today does romantic love become thwarted or undermined because of social or economic factors? Where minor sources of angst between a loving couple are magnified by external pressures? I enjoyed the novel immensely. As for the happy ending – from the subjective viewpoint of reader response – I welcomed it. Real life experience is far too bitter. I have a wordpress blog where I have posted all my poetry and prose.